There was no getting out of Astoria in a hurry. 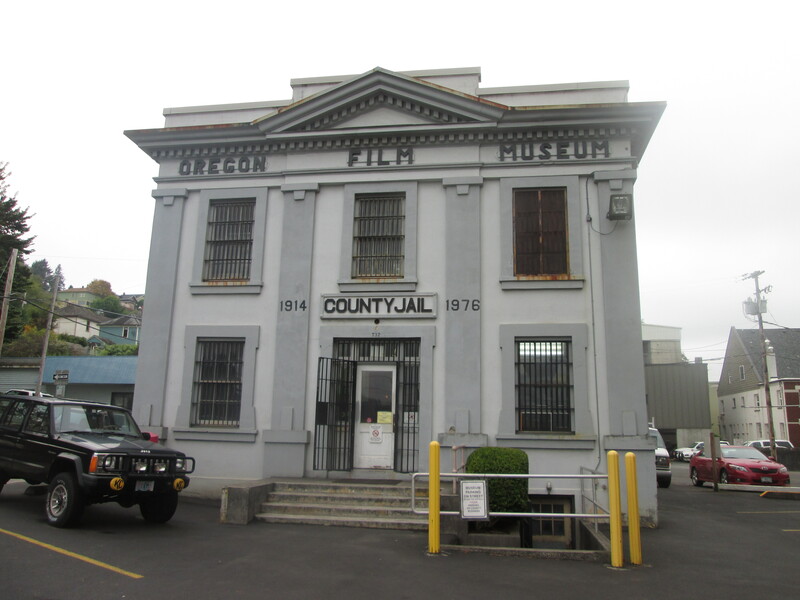 I went and found the jail that was filmed in the Goonies and then when I returned from shopping. I was delayed further with a flat…………pulled a nice piece of glass out of my tyre. Think the tyre is pretty much finished now as it has left a bit of a hole. Getting sick of all the crap that you have to cycle through on the hard shoulder and had to cycle through a few tunnels today. Before you enter cyclists have to push a button that activates warning lights that let drivers know cyclists are in the tunnel. 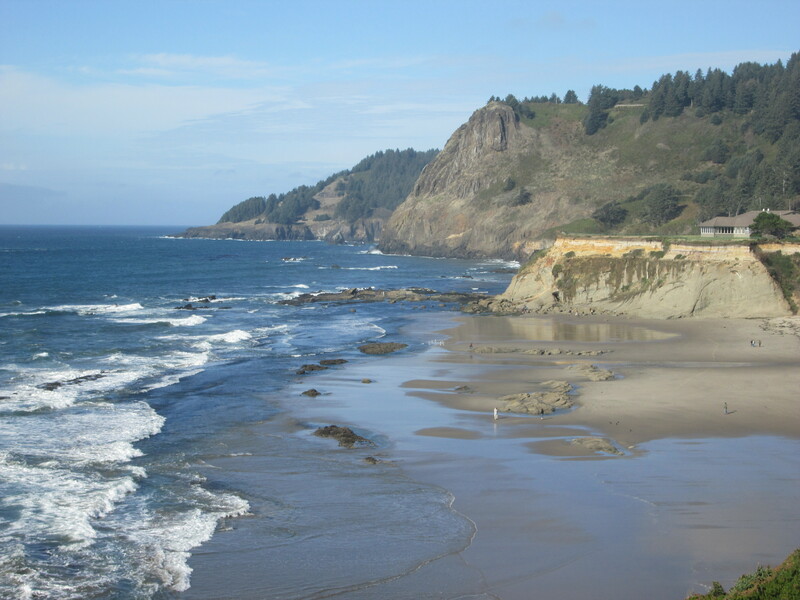 The beaches all of a sudden became very long and sandy and the road climbed high above the coast for an awesome view. On the way up a guy kindly stopped and gave me a French stick of bread. At the top Tim and Melissa invited me for a cup of coffee. Looking out into the bay from here we could see a couple of Humpback Whales playing. Its impressive when they breathe. This evening I went and camped in the state park at the hiker/biker site which was $6 including hot showers. I arranged to meet another cycle tourist here Glynnis from Canada who I have been put in contact with through Stacey. Overnight I saw my first racoon………yeah… not quite as nice as I thought as I had a running battle with two of the cheeky animals who were after my food. I lost a muffin and two cupcakes. I had to get up at midnight, 2:30 a.m. and 6:00 a.m. to chase them off with an old inner tube. Before breakfast Glynnis and I went down to the beach to watch the sunrise. There were a few waves and we saw what we thought were a few early morning surfers before we realised they were actually a large pod of dolphins which was pretty cool. Glynnis is cycling to San Francisco, where she will meet her sister. She has a lot more time than me. But it will be nice to cycle with her for at least a few days. 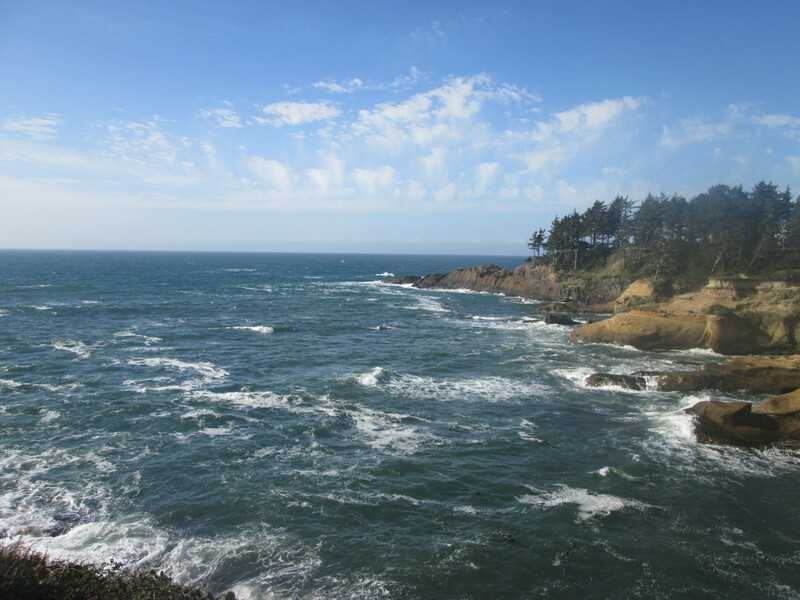 The Oregon coast is really turning out to be beautiful. We stopped at Manhattan beach for morning tea. We pretty much had the beach for ourselves. The sun was out. It was hard to get going again. 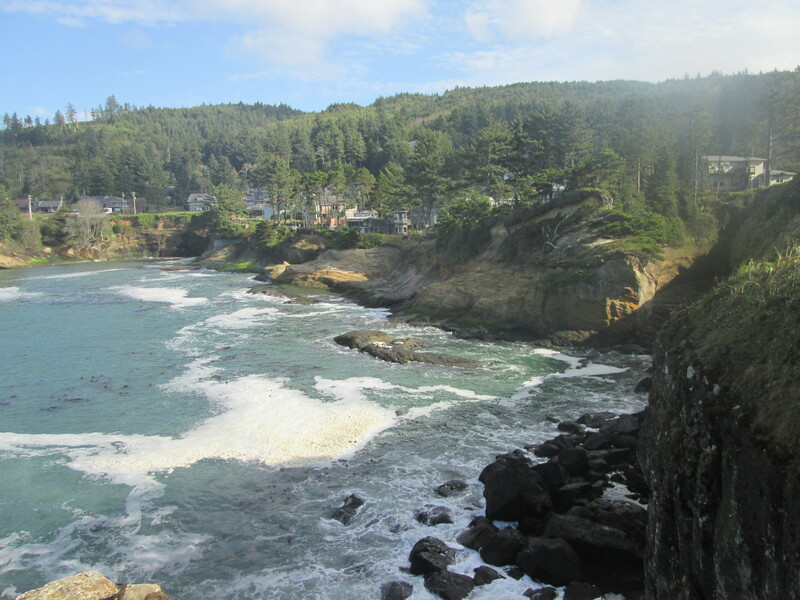 The coast is littered with small resort towns. 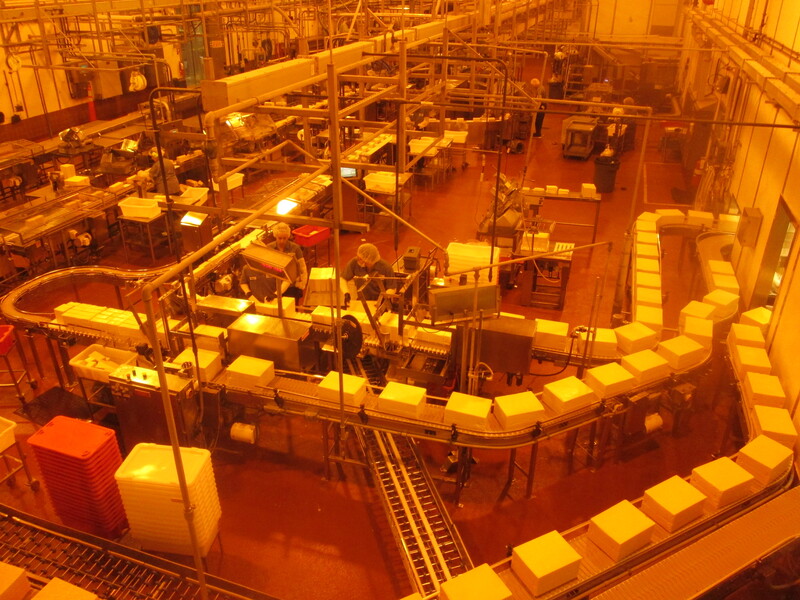 After lunch we called into the Tillamook cheese factory, where we did a small self-guided tour and then got to sample lots of cheese, before finishing off the visit with a big ice-cream. 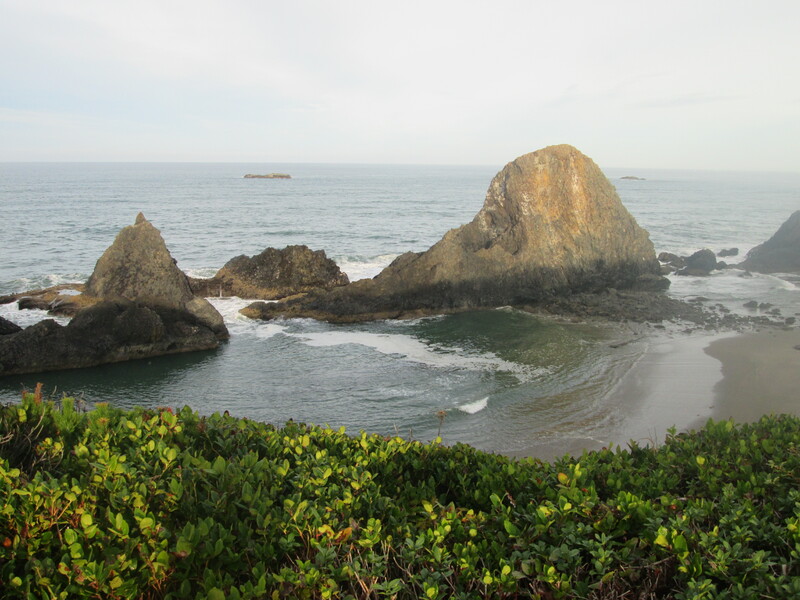 The coast is also littered with Hiker/Biker campgrounds which are part of the many state parks. 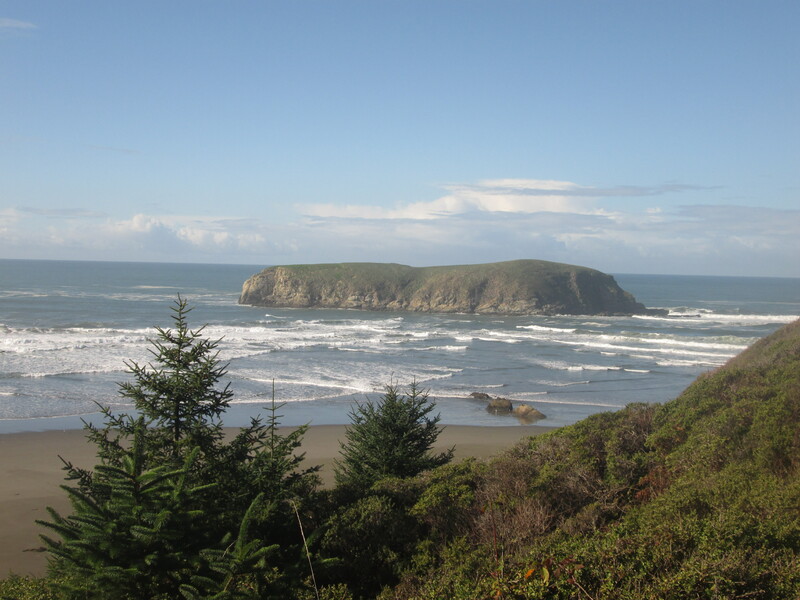 This evening we camped at Cape Lookout. Again just a short walk from the beach. We had two other cyclists camp with us tonight, Josh and Kaylee from Colorado. 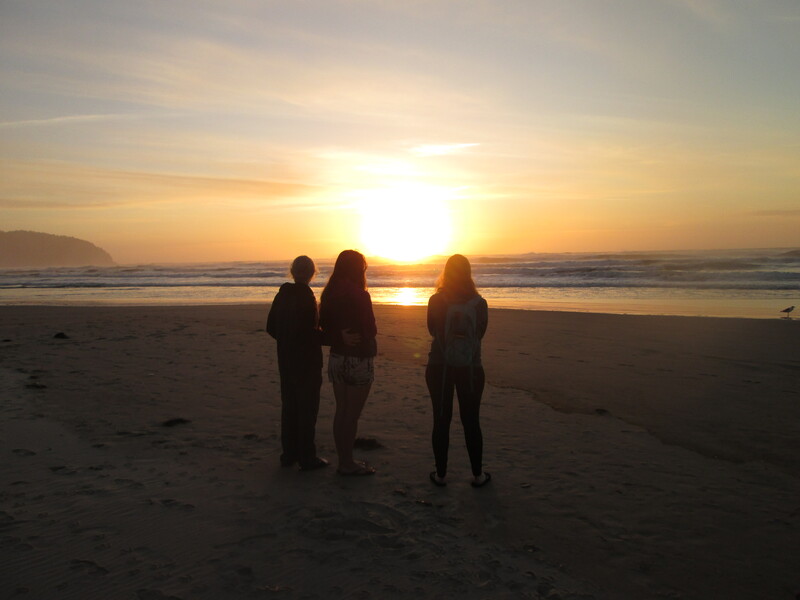 We all went down to the beach to watch the sunset. I did take a few more precautions against the racoons. It didn’t work. They were able to get into one of my panniers and destroyed a banana, muesli and pasta. I wasn’t the only victim. Glynnis lost a bag of Trail mix when the cheeky beggars unzipped her seat bag. The other two didn’t faremuch better……….losing a loaf of bread, lip balm and some other stuff. First off, we had a steep climb, wasn’t too bad. During the day we crossed the 45th parallel line which means we are half-way to the Equator. Sounds like a long way away. Our lunch stops just get better and better. 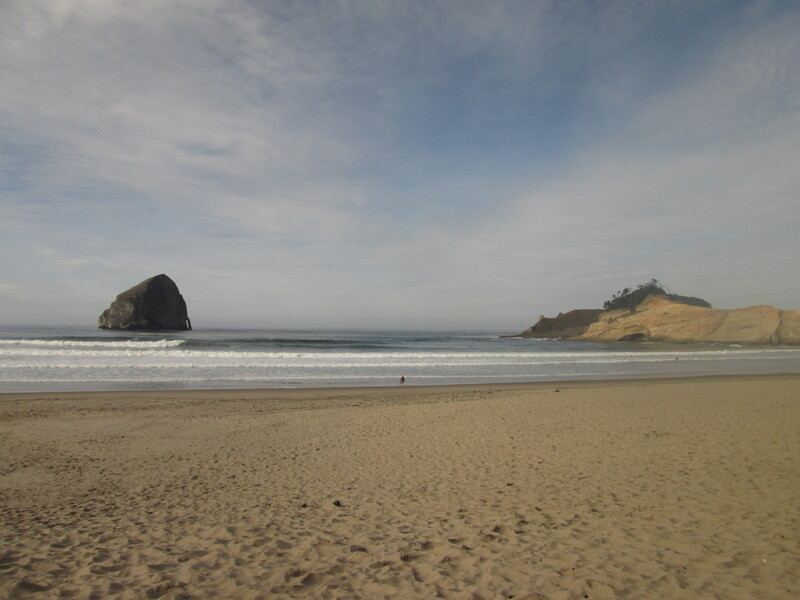 Cape Kiwanda had some huge sand dunes and a rock outcrop and one huge rock sitting in the middle of the bay with a few surfers trying their luck. The Hiker/Biker was right in a residential part of town and again there were plenty of racoons around. 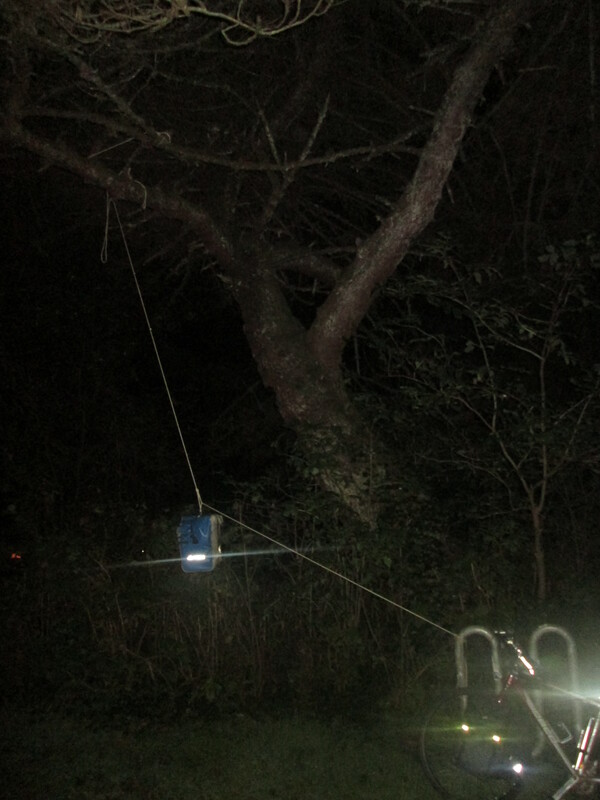 This time I tied my panniers off the ground with a rope. Only problem was the rope got a bit stuck. 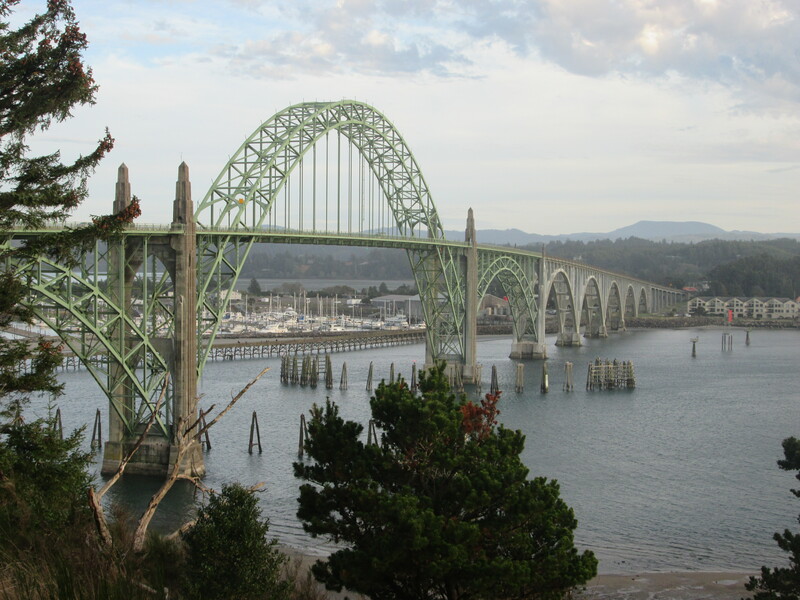 We didn’t go far, today was certainly the best cycling day on the Oregon coast so far. We were constantly stopping to see cool stuff and take in the breath-taking views. Life is just great……….when the sun is out. 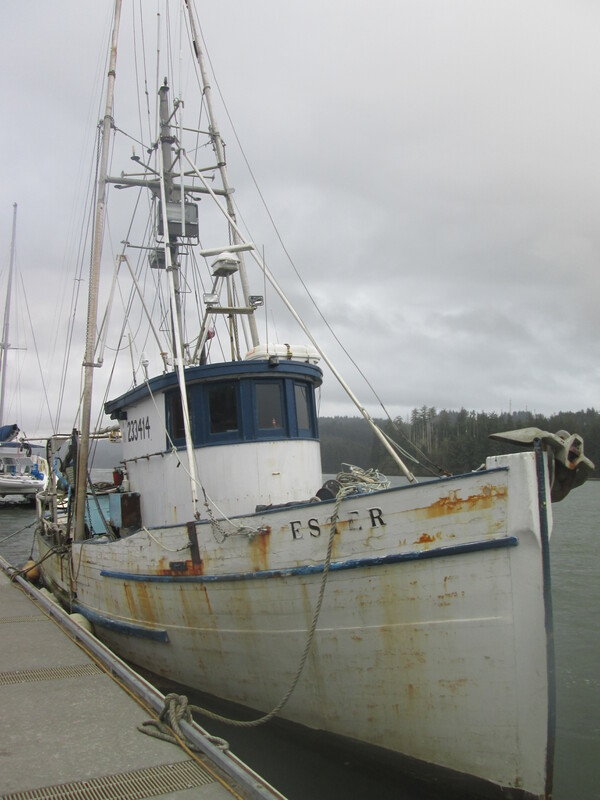 Our first stop was at Boiler Point, which had a couple of blow holes. 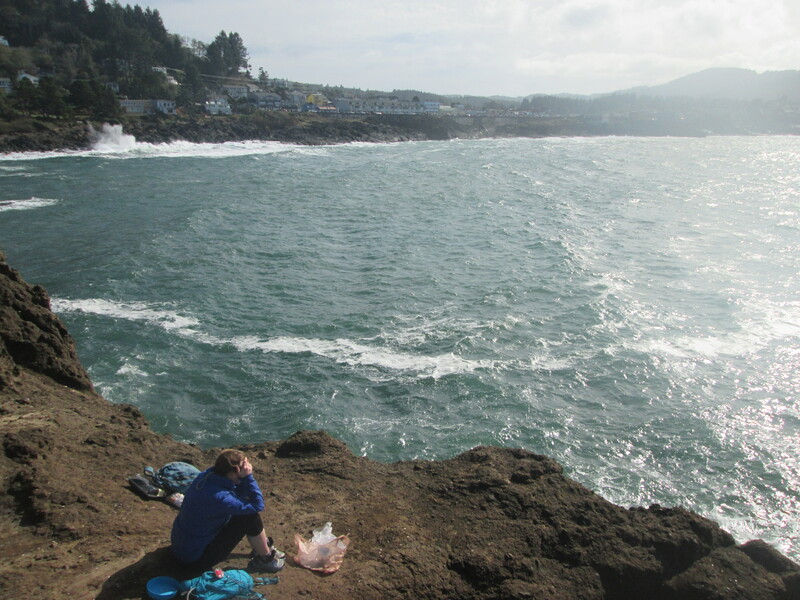 From here we could see across the bay to Depoe Bay. We could see some whales in the distance so we headed over there. Glynnis and I cycled out to one end of the bay and after a short walk we were sitting on the rocks eating our lunch while we watched whales swimming in the bay. It was so cool. A small seal turned up as well. It was a little windy and the waves were crashing over the rocks. After lunch we went for a small walk along the cliff top. In the next bay was a small group of harbour seals sunning themselves. After our long lunch we were able to take the very scenic costal road which gave us a nice break from the traffic. 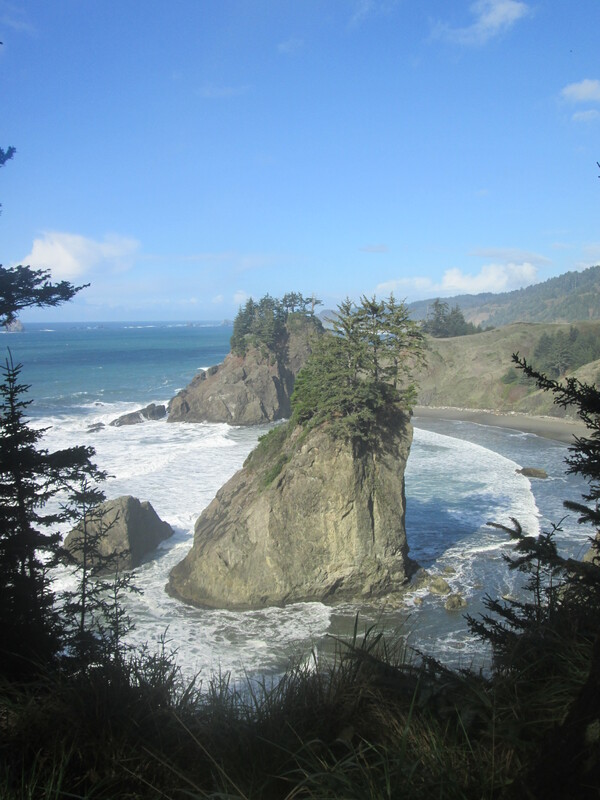 We climbed up to Foulweather point which is the highest point of the road on the Oregon coast. From here we saw some more whales, both Humpback and Gray. 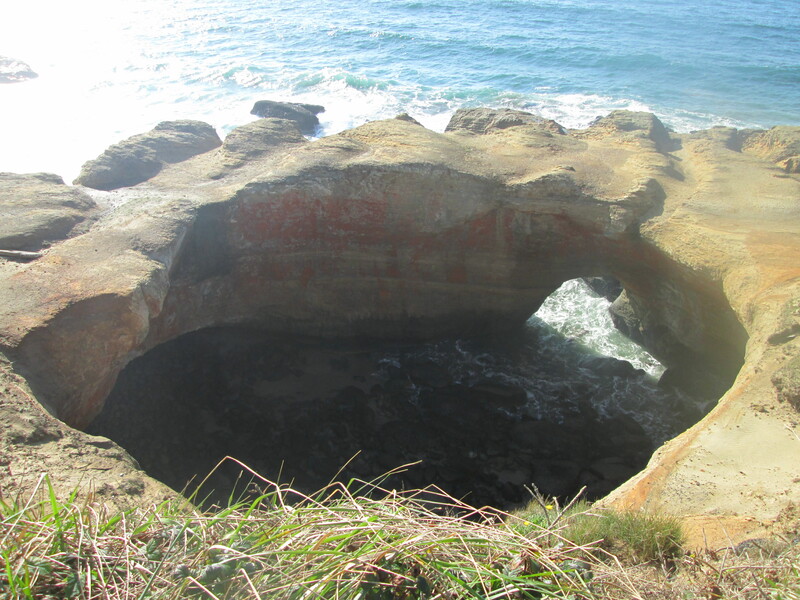 What goes up must come down and we had a good fast ride back down to the coast and the next point of interest was Devil’s Punch Bowl where the ocean has carved out a little tunnel in to a big bowl. We were both pretty tired when we got into Newport. We stopped for a quick beer at the pub and I was happy to check the rugby result to find the All Blacks had won their semi with South Africa 20-18. Sunday was a good day to have off because the weather was really foul. It was just a shame we couldn’t do anything but cycle the 3 km back into town and sit in a coffee shop for most of the day. We had planned to visit a local bike shop where we heard you could do washing and just hang out and chill. So it was a bit of a disappointment when we turned up and it was closed. It meant we had to go to the laundry mat to do our washing. It must have been laundry y day because it was packed with people. 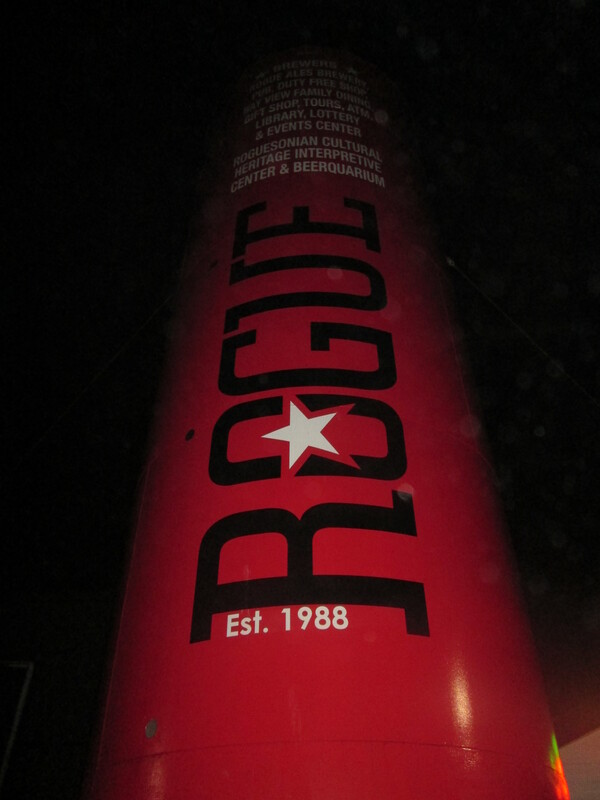 The lazy day finished with a visit to Rouge Nation the local brewery. To get to the restaurant you have to walk through the brewery which was interesting as it was like you were doing a little tour on the way in. 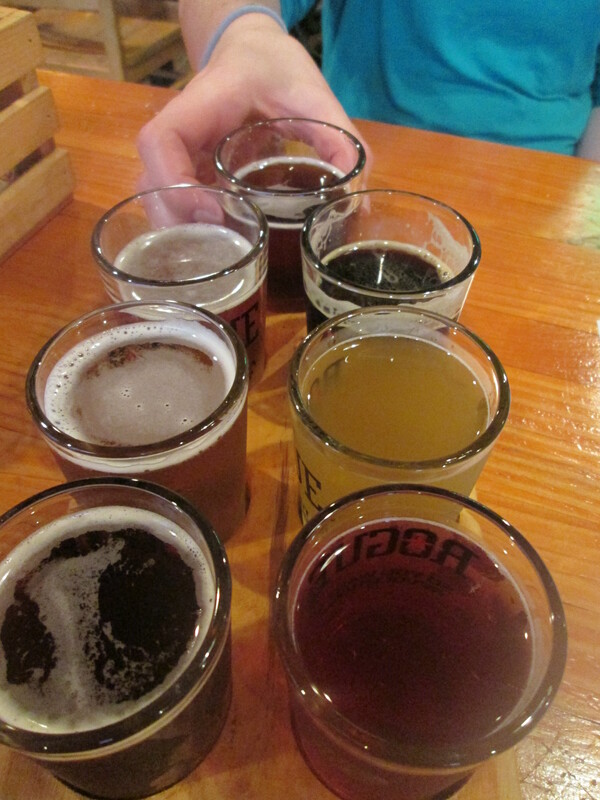 Glynnis and I did the Beer Taster where we got to pick 7 beers to taste. It was fun and the best beer was the chocolate stout. Was so good to see the sun out, to be able to have a proper day to explore Newport. Having cycled back into the city over the huge bridge, well actually I pushed my bike again, I saw seals swimming under the bridge. After some lunch I cycled back along the coast to the old historic light house for a short tour before cycling under the bridge and down to Old Port. 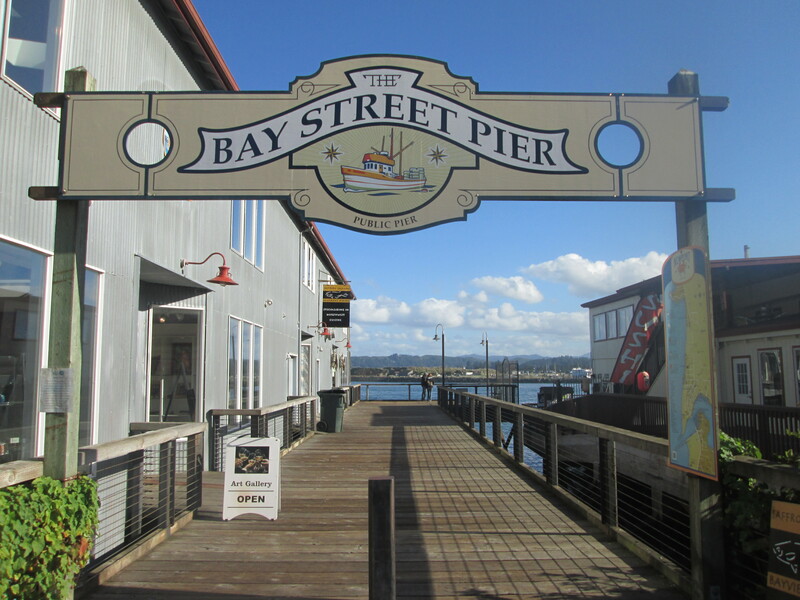 Along the waterfront were a few restaurants, pubs scattered between a few fish processing plants and hanging out close by were at least 50 californian seals making a huge racket. 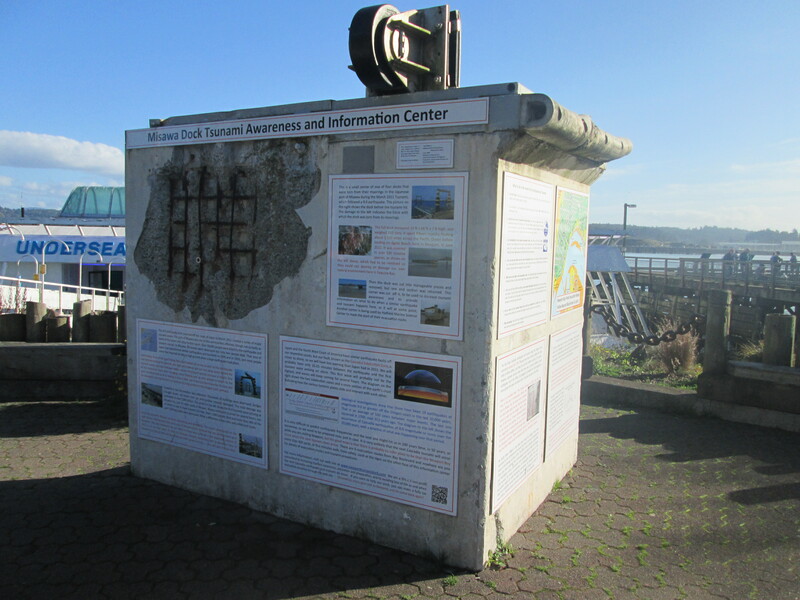 On the water ront was a huge chunk of concrete that was once part of a wharf in Japan and was ripped away in a tsunami after the earthquake in 2011 and then took 15 months to float across the Pacific before landing on the beach near here. I got back to the campsite around 5 p.m. in time to do a little bit of much needed maintenance on the bike and a nice relaxing walk on the beach. It was a nice evening and I scavenged up enough firewood for a camp fire. This morning I parted ways with Glynnis after a fun and nice week cycling together. Unfortunately we are both on different time schedules and it is time for me to push on. 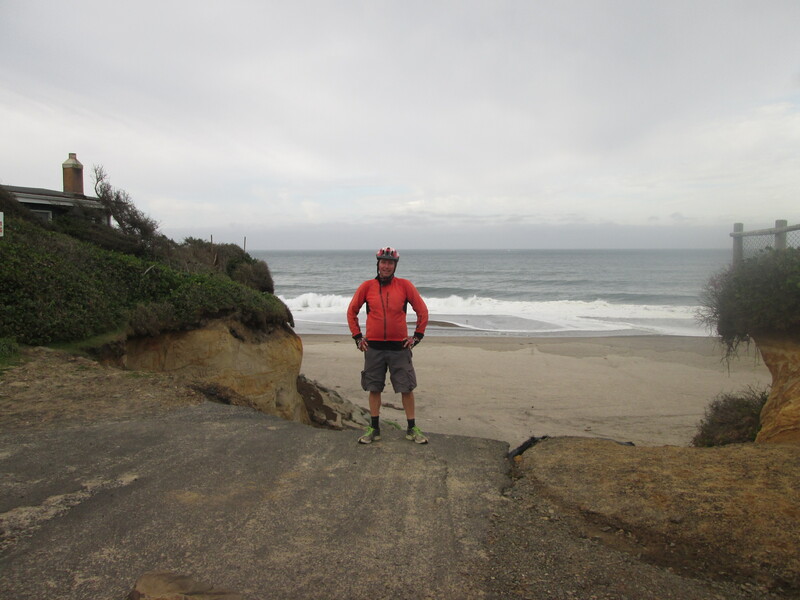 It was another great day cycling down the coast seeing some great rock formations. One spot had a couple of active blow holes and at another spot the waves were being forced through a small narrow channel. Early start led to an early finish. I was the only cyclist camping in the hiker/biker. I had enough time before dusk for a nice walk along the beach. the tide was going out and there were miles of sand stretching out to meet the ocean. Had a lot of rain in the night. At one stage I had a little stream of water flowing through the tent. So I had to quickly rearrange a few things in an effort to keep things dry. I had a bit of a late start waiting for the rain to stop and the sun to come up. It was past 8 a.m. before I ventured out. Not a fan of starting too late as the cycling day just seems to go so fast. My first stop of the morning was only a few kilometres down the road at Hecetta Head to visit the lighthouse. I an hour walking up to the lighthouse from the beach and around the grounds of the lightkeeper’s house. 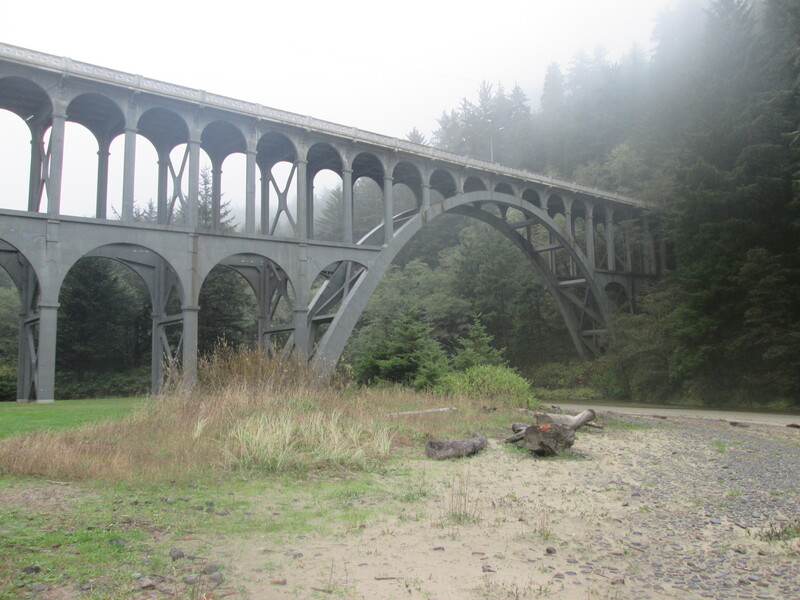 From the beach I could see a long arched bridge crossing the river before heading straight into a tunnel. After lunch I was cycling through Florence when I heard someone shouting at me. Joshua and Kaylee who I had last camped with in Newport had seen me cycle past their motel room and ran out to grab me. They have had a bit of bad luck. Last night Joshua had his bike run over by an elderly lady in the car park. His bike is pretty much a right off. I hung out with Joshua and Kaylee for a few hours. We ended up going for a walk around the old part of town and along the waterfront through the marina with its mixture of fishing, sailing boats and motor launches. I left my 9 km run south to my “Warm Showers” host a bit late because I got caught in a rain storm. Chris is my first host with negative feedback. I wasn’t going to let that bother me and for good reason, Chris has been a great host. Very easy going and him and his flatmate Mark are connoisseurs of mushrooms and we feasted on Golden Chanterelles and a few others they had collected earlier in the day. After two straight weeks in the tent, It was nice to bed down inside in front of the fire. Chris very easily talked me into staying another night. In the morning we went round to Gerry one of his friends for coffee and we then went for a spin in a jet boat on the lake out front before helping to take the boat out for the winter. In the afternoon we all went for a hike in the woods on some old logging trails. 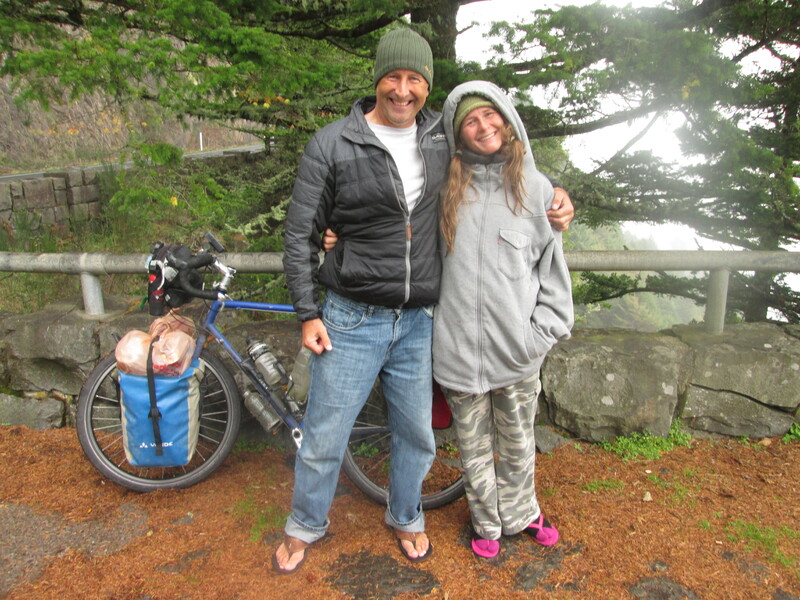 That evening Chris hosted another cyclist, Flo from France who is a medical student cycling around the US for one year. We all went back to Gerry’s for Thursday night college football, pizza, beer and dips. After three hours with triple extra time, I know the rules of American football pretty well. What a rubbish day…………wet and cold. Just perfect for cycling. I thought about staying another night………..at 9:30 a.m. I psyched myself up enough to get out in it. Flo had mentioned he had seen a girl cycling Into the state park just as he had turned off. So I thought I would call in there on my way and sure enough it was Glynnis. She is now cycling with Ian who we called the homeless guy who is on a no money tour relying on people’s kindness to survive. He likes his drugs and his booze. I arranged to meet them at the next campsite for a bit of a group dinner. It was a bit of a no photo day……….head down and pushing on. Still took all day to do 50 km. 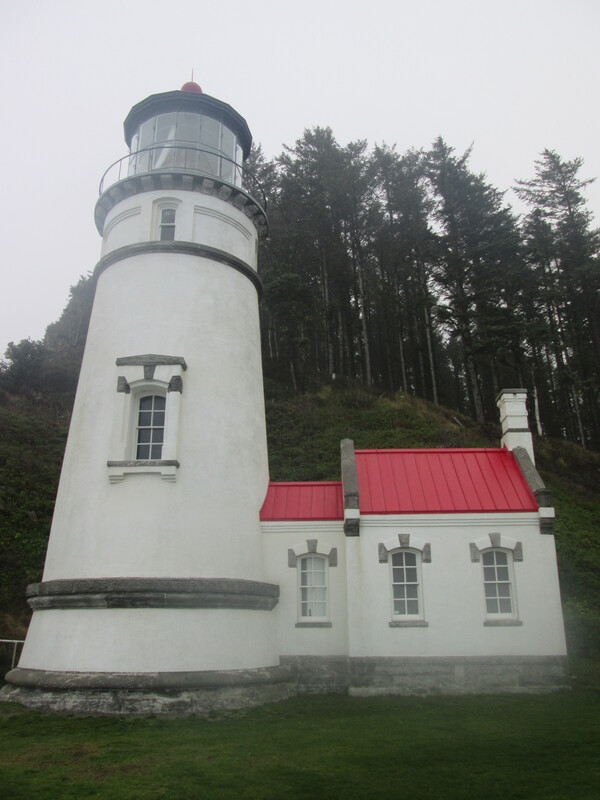 I got to the Umpqua lighthouse at 4 p.m. and set my tent up. I needn’t have bothered because I had arranged to catch up with Karla, a cycle tourist I had met earlier just outside Whitehorse in the Yukon back in June. She has just been in Korea cycling but is now driving down the coast to California to visit relatives before heading back to Alaska. She ended up getting a yurt to stay in for the night. Lucky for me there was plenty of room on the pull-out couch. The yurt was good for $40 with a heater and electric. I was thankful to be out of the rain. We caught up with Glynnis and Ian and we had fun cooking our dinner in the rain. North Bend so I could go to the info centre to use the wifi to get updated scores of the last 20 minutes of the rugby world cup final between New Zealand and Australia. 34-17 was a great result and I was pretty happy when I left. even with the bad weather. The forecast is for the arrival of a big storm. I thought I would try and get a “Warm Showers” host. 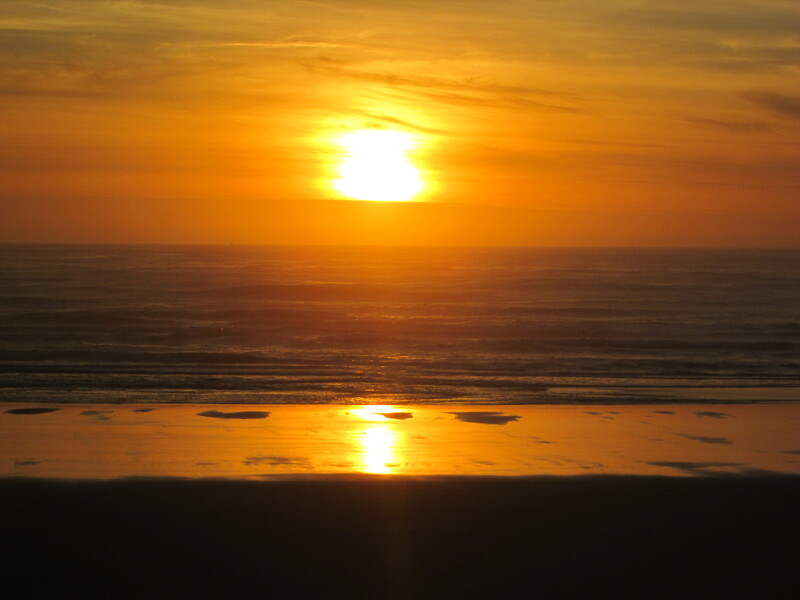 At very short notice, I was very lucky to to be hosted in Bandon by Suzy and Ed. They had a nice place by the lake, some way off the main road and a little south of town. That night I went for a bit of culture by going to see Always Patsy Cline at the Bandon theatre. I now know the whole life story of Patsy Cline. That night it was a terrible stormy night. I listened all night to the rain thinking I am not keen to be cycling in this. I nearly talked myself into staying another night. The clocks went back an hour overnight. It was 10 a.m. before I got away. It wasn’t long before I was soaking wet. 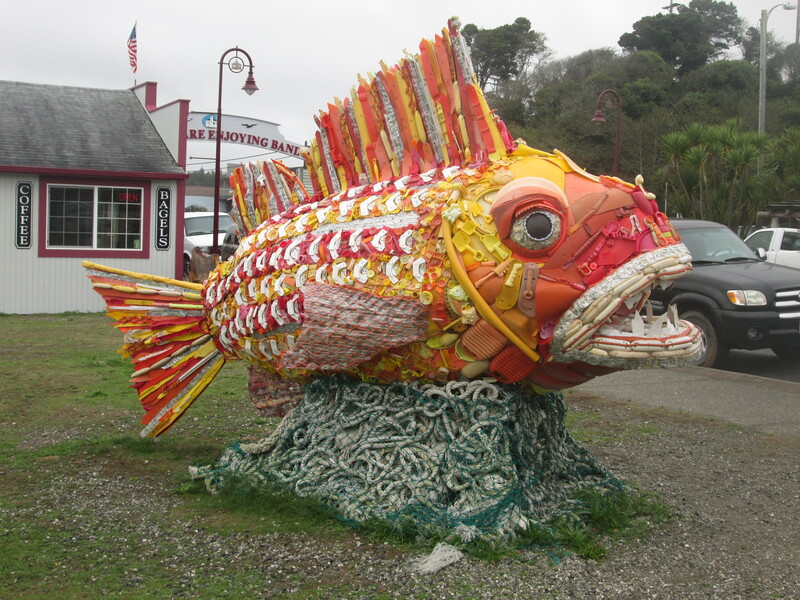 When I got to Port Orford I saw a couple of cyclists in the cafe. So I called in to say hello. 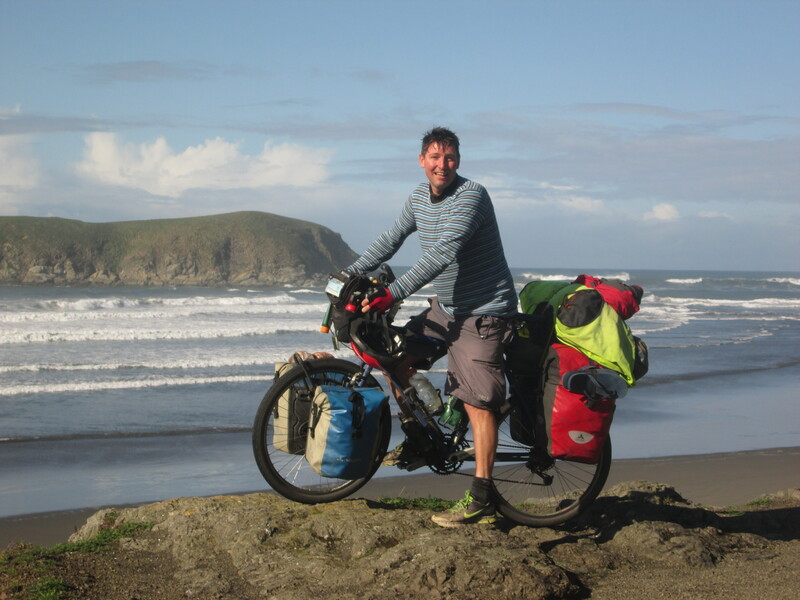 I had met Jamie briefly at the camp site back in Florence and he was cycling with Rebecca. We decided to cycle the remainder of the day together. We briefly ran into Flo again. He was stopped on the side of the road with a puncture. It was pretty dark when we arrived in Gold Beach now that the clocks have gone back it is dark by 5 p.m. They had a nice shelter there, where we were able to cook out of the rain and also to hang up all our wet clothes giving them a better chance to dry. It rained a hell of lot in the night. But a morning of sun was very welcome. 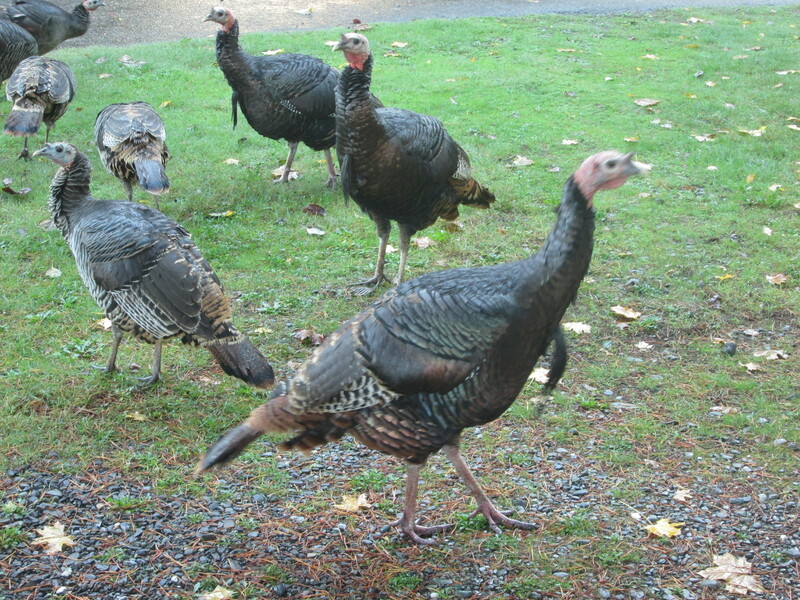 During breakfast there was a strange sight as we had a dozen wild turkeys fly in and quickly run past us. Sun equals an awesome day cycling down the coast with a mixture of hill climbs and stretches cycling along the beach. We stopped to take lots of photos. 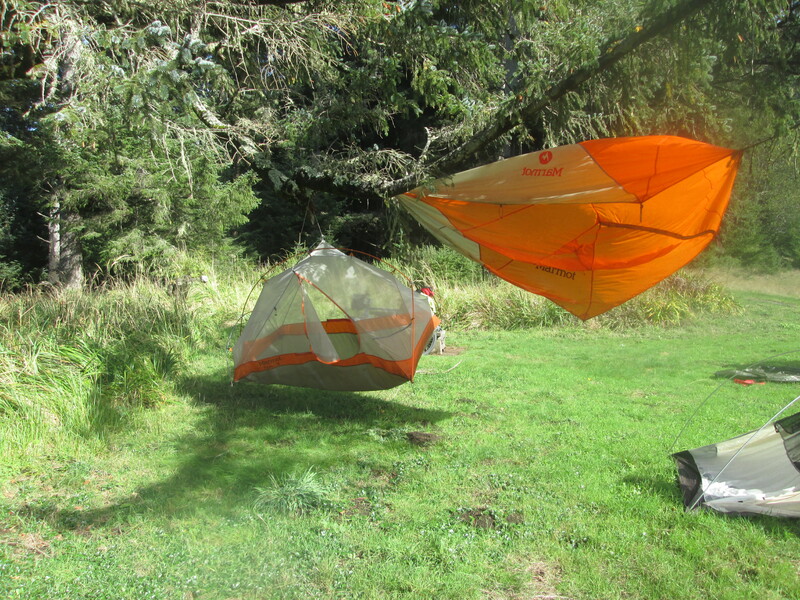 At lunch we stopped and set up our tents to dry whilst we had something to eat. Late afternoon we reached Brooking and after some grocery shopping cycled down the road and crossed over into California which will be my last state in America before crossing over into Mexico. 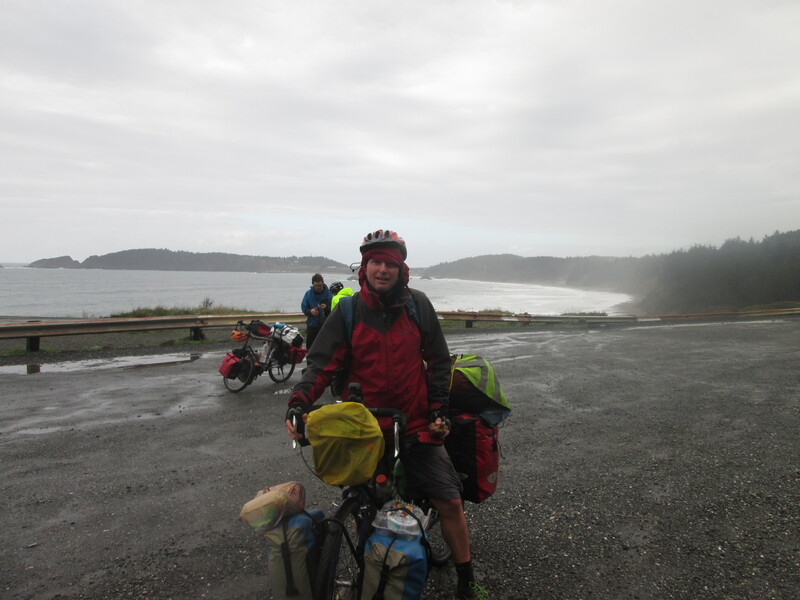 It all went a bit pear-shape right at the end of the day as we cycled out of Crescent city. A guy stopped and warned us that we would be disappointed when we got to the top of the hill because the state park was closed so we had to cycle back out the other side of town a few miles and find a spot. We camped in some grazing land behind some sand dunes…………During the day I had discovered my cassette is a bit loose so I will have to have a look at that in the morning before I set off.